Soak quinoa in 2 cups of water with a squeeze of lemon juice overnight. Rinse quinoa under cold running water and drain. Bring 1 3/4 cups water to a boil in a small pot. Stir quinoa and a pinch of salt into water. Reduce heat, cover and simmer until tender and liquid is absorbed for approximately 15 to 20 minutes. Uncover and let cool. 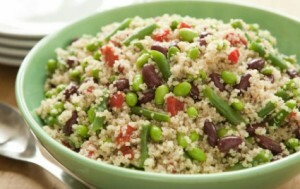 Put cooled quinoa, green beans, edamame, peppers, kidney beans, tarragon, salt and pepper into a large bowl and toss well. Serve chilled or at room temperature with dollop of yoghurt.